South Korean Prime Minister Lee Nak-yon has called U.S. President Donald Trump "a tough dealer" seasoned through a number of deal-making experiences, referring to a recent roller coaster of developments surrounding an upcoming summit with North Korea. "President Trump has a sixth sense. He must have gone through a number of things from deal-making experiences. The closest thing to describe him would be a tough dealer," Lee said Sunday during a meeting in London with reporters traveling together with him on a European trip. As North Korea stepped up criticism of the United States with threats to reconsider their June 12 summit in Singapore, Trump struck back by calling the planned meeting off altogether last week in a surprising move that took Pyongyang completely off guard. Trump's tactic worked as the North immediately asked for the summit to go ahead as scheduled. On Sunday, senior officials of the U.S. and the North held pre-summit negotiations at the inter-Korean border village of Panmunjom. South Korean President Moon Jae-in and North Korean leader Kim Jong-un also held a surprise meeting at Panmunjom on Saturday. The North's leader first asked for a meeting with Moon. 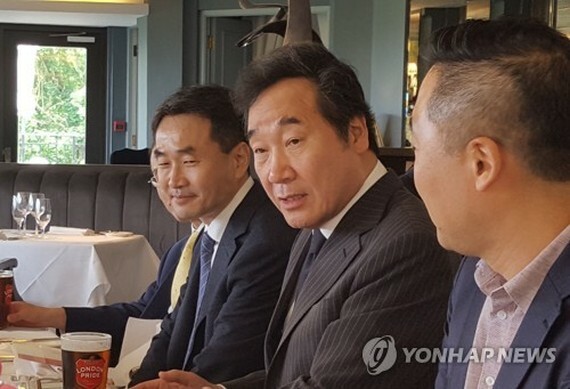 "It's not that President Moon first asked to play a mediating role. It was North Korea that first requested a meeting. This is a very important fact," Lee said. Lee also said he believes the U.S.-North Korea summit will take place as planned as "leaders share political risks" from the meeting falling apart. Asked if President Moon would travel to Singapore, Lee said that discussions between Trump and Kim are not expected to go as far as to talk about formally ending the Korean War. That means Moon is unlikely to travel to the Southeast Asian nation.